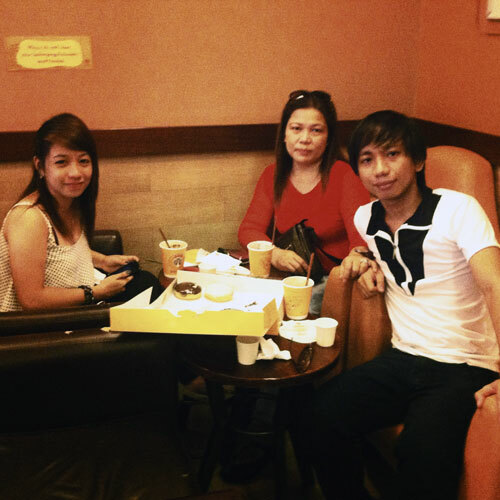 My mother, sister and I decided to eat in J.Co Donuts to celebrate mother’s day. It was around 4pm. There were lots of people. Some were eating, some were in line, some were waiting for others to go. It was really the new food trend this time. We were talking about life in general while we ate one dozen of assorted donuts and drank frappe. It filled our stomachs fast to the point where we didn’t want to eat anymore. This was the part one of our celebration. This entry was posted in Food Corner, People & Events and tagged bonding, celebration, donuts, family, food, mother's day. Bookmark the permalink.